The Tempest first saw combat on July 8, 1944 over Normandy, but soon after the Germans launched V-1 “buzz bomb” attacks against London and Southern England, and the Tempest as the fastest low-medium altitude fighter was held back to defend against this weapon. The Tempests were responsible for 636 of 1,846 V-1s destroyed by the AF by the time the V-1 launch sites were overrun in September. 3, 274, 80, 56 and 486 (RNZAF) Squadrons moved to the Continent on September 21, 1944, replacing the Mustang III squadrons in 122 Wing. Soon based at Volkel in Holland, the Tempests were used for “armed reconnaissance,” - low level attack, strafing trains and other transport - as well as air superiority, taking on the Luftwaffe frontline fighter units. In February 1945, 222 and 33 Squadrons of 135 Wing converted to the Tempest and were joined by 274 Squadron. 52 German fighters were shot down during December 1944, with 89 trains destroyed, for the loss of 20 Tempests. Following the Operation Bodenplatte of 1 January 1945, 122 Wing bore the brunt of low to medium altitude fighter operations for the 2TAF Tactical Air Force, with Spitfire XIVs of 125 and 126 Wings often providing medium to high altitude cover for the Tempests. The Wing lost 47 pilots in January, 1945. Throughout the period from January to March, 1945, Tempests flew “rat scrambles,” particularly over the Me 262 and Ar 234 base at Rheine‑Hopsten, to catch jets that were most vulnerable during take-off and landing. Luftwaffe pilot Hubert Lange said, "The Messerschmitt Me 262's most dangerous opponent was the British Hawker Tempest — extremely fast at low altitudes, highly‑maneuverable and heavily‑armed." After seven Tempests were lost to flak at Rheine‑Hopsten in a single week, the "Rat Scramble" was discontinued. In air‑to‑air combat, the Tempest units shot down 239 German aircraft between November 1944 and the end of the war, achieving an estimated air combat success ratio of 7:1 while accomplishing a 6:1 ratio against single seat enemy fighters. Donald Charles “Foob” Fairbanks was born in Ithaca, NY, in 1923, the son of a professor at Cornell University, and eventually became the top-scoring Tempest pilot of World War II, flying with the RCAF. Fairbanks became deeply interested in aviation at a young age. When he graduated from high school in 1940, he discovered he could not join any U.S. air force without two years of college, so he ran away from home and joined the RCAF in Hamilton, Canada in February 1941. He was rewarded for the flying ability he demonstrated during his training by an assignment as a flight instructor at 13 Flying Training Squadron until February 1943. After completion of advanced training in the UK, he joined 501 Squadron on December 1, 1943, flying Spitfires. He refused transfer to the USAAF that spring of 1944, since he would only qualify as a Flight Officer, not to mention the pay in the RCAF was superior to that of the USAAF (the RCAF being the highest-paid air force of the war), and would be most likely be assigned to P-47s. His first victories were scored over Normandy on June 8, 1944, when he shot down one Bf-109 and damaged another near Le Havre. 501 transitioned to the Tempest that August, and Fairbanks transferred to 274 Squadron, one of the original units equipped with the new fighter, where he shot down a V-1 on August 29, 1944. The move was fortunate for Fairbanks, since 501 remained in the UK on anti-diver duty against V-1s, while 274 was sent to the Continent in September as part of 122 Wing. 274 Squadron as part of 122 Wing was stationed at advanced airfield B.80 at Volkel, Holland, which would be its main base for the remainder of the war until it crossed the Rhine into Germany in April 1945 to be stationed at Celle. The Tempest, being the fastest low-medium altitude fighter in the RAF, had the assignment of direct combat with the Luftwaffe’s frontal fighting force composed of JG 26, JG 2, JG 6 and JG 27 in western Germany. Flying Tempest V EJ762, JJ-F, Fairbanks first demonstrated what he was really made of as a pilot on November 19, 1944. During a ground-strafing mission against rail transport, his Tempest was hit by flak in the leading edge of the left wing, which set the fuel tank afire and rolled the Tempest inverted from the impact during the low-level run-in on the target. Flight Leader Warren Peglar called out to find out who had been hit. Fairbanks’ wingman, Jock Malloy, informed Peglar it was Fairbanks and said he would lead him back to base. In the meantime, Fairbanks, still inverted at low level, flew over the target and then recovered, flipping the Tempest upright which put out the fire, and headed for Volkel on his own. By the time the rest of the flight returned, Fairbanks had already become the subject of the famous photograph of him standing next to his badly-burned Tempest, which had lost all the fabric from the rudder (making his recovery from inverted flight all the more amazing for the increased difficulty). On December 17, 1945, again in the now-repaired EJ762, Fairbanks scored his first two Tempest victories, two Bf-109s shot down and a third damaged. A few days later he was transferred to 3 Squadron, still in 122 Wing, where in January he began to run the score that would make him the top Tempest pilot. During January 1945 he scored an Fw-190D-9 and a Bf-109G shot down, one-and-a-half Ju-52s and two Ju-88s destroyed in strafing attacks. On February 9, 1945, by then known as “The Terror of Rheine” for the many combats he fought in the vicinity of the major German airbase at Rheine, he returned to 274 as Squadron Leader, replacing Squadron Leader Baird who had been shot down in combat with JG 27 the previous day; he was still only 21 at the time. On February 11, 1945, he claimed one Me-262 shot down and one damaged. The airplane he shot down was actually an Ar-234B-1 (W.Nr. 140149) coded "4U+DH" of 1. (F)/123 flown by Hans Felder; Fairbanks was the first to shoot down one of these aircraft. In four other combats over the rest of the month, he shot down two more Bf-109s and four Fw-190D-9s. On February 28, returning with five other Tempests from a train-busting mission, he led an attack on over 40 Fw-190D-9s and Bf-109Ks of JG 26 he spotted forming up over the Black Forest. After a hard fight he was finally shoot down by by Feldwebel Karl‑Georg Genth of 12./JG 26 in an Fw 190D‑9, “Gelbe 15,” and was immediately captured, avoiding a lynch mob of German civilians when a German officer intervened. He spent the rest of the war as a POW, during which he was awarded a bar to his DFC. Returning from captivity, he claimed to have shot down a final Fw0190D-9, though this was never officially credited; however, Luftwaffe casualty records do show a loss at the correct time and place, a Fw-190D-9 of 9./JG 26, “Weiss 17,” flown by Unteroffizier Franz Schmidt. Returning to home after the war, Fairbanks obtained a degree in engineering from Cornell and then went to work for Sperry Gyroscopes in Ontario, and also flew Vampires and T‑33s with the RCAF Auxiliary, as well as spending two years in the UK, where he was able to fly Meteors with 504 Squadron, RAuxAF. In 1955 he returned to Canada to take a position as a test pilot at deHavilland Canada where he worked with former RCAF Spitfire pilot Jerry Billings, testing the Beaver, Otter and Caribou. At Avro Canada he became an expert in STOL flight. He died a natural death at the early age of 52 in 1975. His score of one V-1, 11 aerial victories and four ground victories in the Tempest made him the top Tempest pilot of the war. Kits of the Tempest V have been thin on the ground. Matchbox and Heller produced 1/72 kits back in the early 1970s, with the Matchbox kit convertible to a Tempest II, while AMT released a 1/48 Tempest in around 1976 that needed a lot of work to become a good model. In 1998, Eduard released a 1/48 Tempest V, which also had a lot of mistakes but was the best kit of this airplane available. This kit by Pacific Coast Models in 1/32 is the first time the Tempest has been done in this scale. 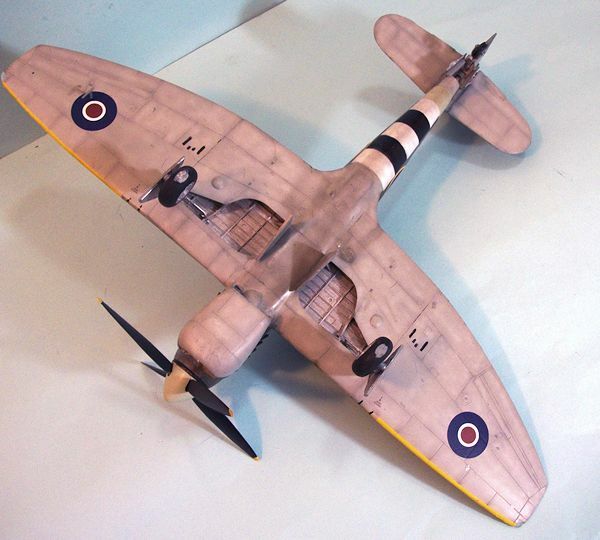 The project benefitted from input from kitmaker and Tempest expert Roy Sutherland and Tempest historian Chris Thomas, with the result that it is the first completely dimensionally-accurate kit of this airplane. 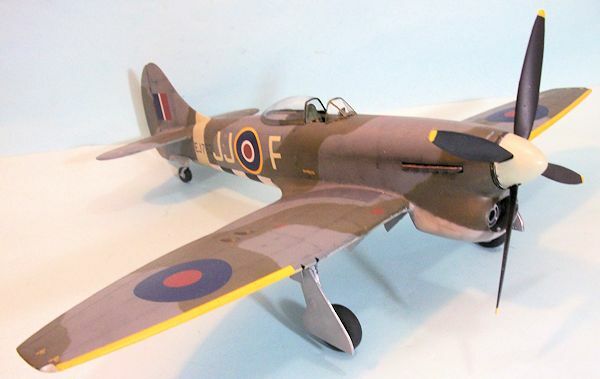 Interestingly enough, after never having a 1/32 Tempest, there are now about to be two kits, with Special Hobby releasing a 1/32 kit that can be made as a radial-engined Tempest II, or the Sabre-powered Tempest V and VI. This is a limited-run kit produced for PCM by Sword, and is similar to their previous releases for PCM like the Re. 2005, Hurricane, and Spitfire XIV. The kit does seem to me to be a bit more primitive in terms of production quality than the other PCM kits, with numerous ejection towers to be cut off parts in strange places, though overall quality is excellent for a limited-run kit. Cartograf decals cover five different Tempest Vs flown during the war and shortly after, and are of excellent quality, with all versions of national insignia used by the airplane during its service, and complete stencils. I was surprised that the decals did not cover aircraft flown by some of the more prominent Tempest pilots, such as David “Foob” Fairbanks, the top Tempest ace, or Pierre Clostermann; perhaps these markings will appear in the other kit. There is one Major Problem with the kit, which I discovered the hard way. That is that the plastic parts for the radiator faces are slightly too large. If you do not reduce them in size, fit of the lower cowling of the fuselage will be problematic, and will result in a lot of industrial-strength pushing and shoving to get it together and then mate the fuselage to the wing, not to mention you will use a lot of putty and sanding sticks getting the poor fit to finally look right, and in the end SWMBO will Severely Admonish you for the crime of using Inappropriate Language Around Children. You can avoid this problem completely by sanding down these parts by about 1/32 inch all the way around, and then cutting down the photoetch radiator faces to fit. Do not worry if the end result is these are now a bit undersized, since when the cowling is closed up, you will not be able to tell. What you will accomplish by doing this is ensure excellent fit for the fuselage, and no problem in joining the fuselage to the wing sub-assembly. Keep in mind that this is a limited-run kit; you will use putty and filler on all joints, and then you will need to rescribe lost detail. None of this should present any problem to anyone who has done at least one other limited-run model successfully. The cockpit is nicely detailed. Be sure to put the side panels onto the side frames before further assembly. I have been assured by the Tempest Boffins that the instruction to paint the cockpit British Interior Green is right. At later points, the upper part of the cockpit, and all of some cockpits, were overpainted with black, but no one knows which ones. Thus, you can do it all green or do the upper part in black, which I would personally limit to those airplanes operating toward the end of the war and just afterwards. The pre-painted photoetch detail by Eduard is very nice. I managed to drop several of the little handles and levers, so didn’t use any. Given that the cockpit opening is small, most viewers of the completed model will never notice their absence. When it came time to assemble the spinner, I found that the short-chord (blunt) spinner doesn’t fit the backplate and prop blades right without a lot of cutting and trimming where the blades are supposed to fit. However, the long-chord spinner fits without problem. This is a Big Problem because the blunt spinner was used on all Tempests up to the late-war SNxxx series and not all of them used the long-chord spinner, according to Chris Thomas (Mr. Typhoon-Tempest), and three of the five optional aircraft thus use the short-chord spinner. You will have to do that modification and test-fitting before you do any painting. Check photos of the airplane you are modeling. I did the necessary work, which is mostly in deepening the cutouts for the prop blades, since the airplane I modeled definitely used the short-chord spinner. The continuing discussion of whether British airplanes used matts for creating camouflage patterns has heated up of late. The instructions to this kit say that the camouflage pattern varied slightly between aircraft. 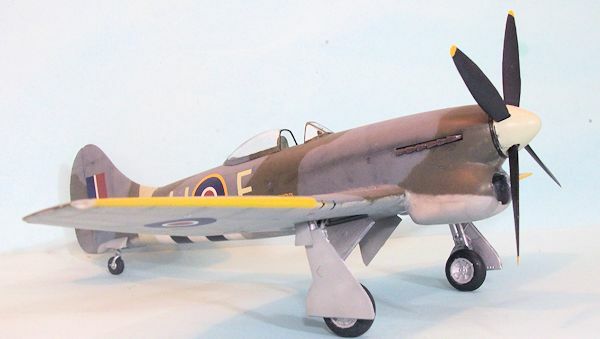 Photos show the edges of the camouflage is not “hard edged” as on early mark Spitfires and Hurricanes. Most likely, the pattern was chalked on the airplane and painted with a spraygun, with the edges done tightly. Having seen this on full-scale restorations, from a distance of more than 10 feet (2 inches in 1/32 scale) the camouflage pattern done this way looks “hard eged.” So I did mine freehand, using the camouflage pattern shown in the old Profile Publications Typhoon and Tempest Camouflage and Markings booklet. I used Tamiya’s RAF paints: Ocean Green, Dark Green and Sea Grey Medium, with each lightened a bit to do post-shading. 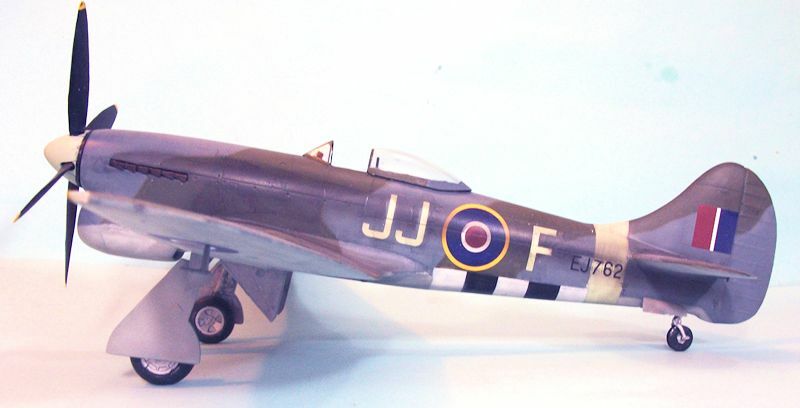 I also painted the D-Day black/white stripes on the lower fuselage and masked them prior to camouflage; as well the Sky band around the rear fuselage and the yellow leading edges of the outer wings. The markings options offered by the kit are very nice, but I wanted to do one of Fairbanks’ Tempests. The decals can be cut and modified without problem to create his first one, EJ762/JJ-F, which I did. Should you do this one (it’s a popular choice), do be aware that the profile in Chris Thomas’ book is not right. Chris has recently seen a photograph (which he showed me that I cannot show you) that finally shows the left side of Fairbanks’ airplane from about the 8 o’clock position, which confirms that the “JJ” did not have upturned lower tips, and that the “F” had equal-length horizontal bars. So, if you want to do Fairbanks’ airplane, do it as I did here. When Fairbanks got his airplane back from the repair shop in December 1944, there was still a long streak of smoke-blackened paint down the left side of the fuselage, which had only been wiped off the squadron ID letters and serial number, with that over the paint and national insignia left alone. This makes for a very different look, and one that I decided to recreate with Tamiya “Smoke.” Looking at the new photo Chris Thomas had shown me, I did a large smoky strip over the fuselage, leaving the port leading edge gas tank clean since it would have been replaced after being blown open by flak, and keeping smoke off the rudder which would have been replaced after the fabric was burned off. The result is a model of the airplane as it likely appeared when Fairbanks scored his first Tempest air-to-air victories on December 17, 1944. I attached the landing gear, exhaust stacks, and prop, and posed the canopy open. At the moment, the 44-gallon drop tanks are not attached to the wing, since I couldn’t get them finished in time for the necessary photography deadline for this review, but they will be on the model by the time you read this. Even with the difficulties I ran into with this project (which you can avoid, now that you know where the “minefields” are), the end result is a good-looking model of this important airplane. 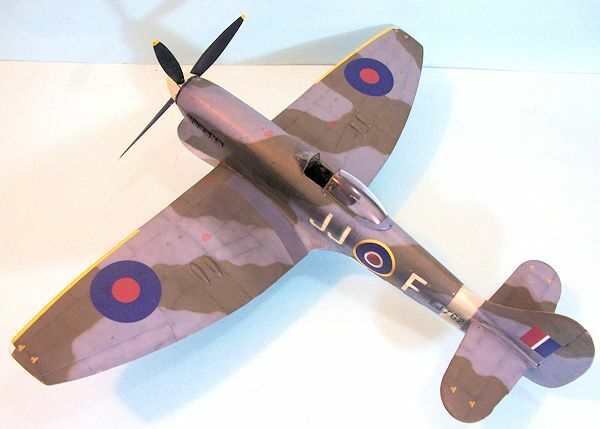 It definitely looks good sitting next to my 1/32 Hawker Fury, Hurricanes, Typhoon and Sea Fury. The model is not difficult for anyone with any experience in constructing limited-run kits and is highly recommended.